1. It tells us who we are. 2. Nothing compares to OPM when we want to express what we feel. 3. BIRIT!! We know it’s fun and we love to do it! 4. 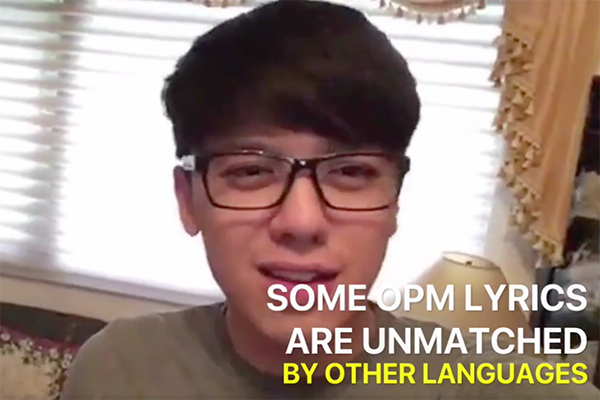 Like the word “lambing”, OPM lyrics can’t be matched by other languages. 5. OPM hits you hard, hits you deep. 6. OPM is a kind of therapy and it works best when shared, Come see for yourself! 7. It asks life’s hardest questions. 8. ...and gives the most honest answers. 9. It’s the soundtrack of our lives. 10.We own it, we should celebrate it! You too can sing and meet other people who love OPM in FilipiNotes UPSIZED - a bigger and better OPM Open Mic in celebration of Linggo ng Musikang Pilipino: July 26, 2016; 12 Monkeys Music Hall & Pub at 8PM. For more information, follow FilipiNotes on Facebook, Twitter, and Instagram or register for the event at http://bit.ly/2947mvd.